So simple practically anyone can try! 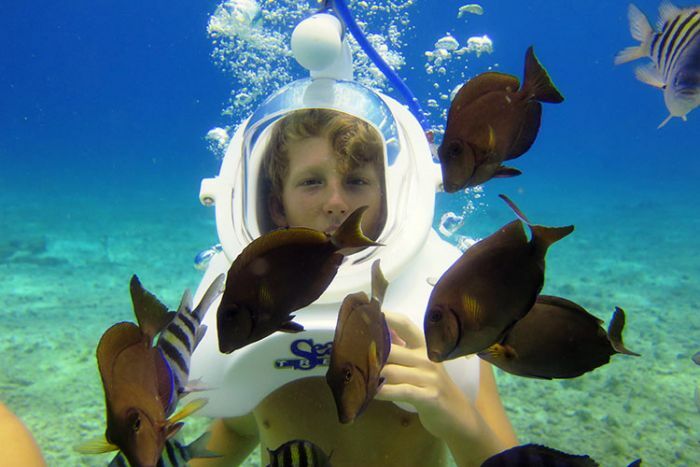 Visit Cozumel's top beach park, Chankanaab and dive face-to-face with friendly marine life, on our guided underwater walking tour for non-swimmers and guests aged 8 to 80 years and above. 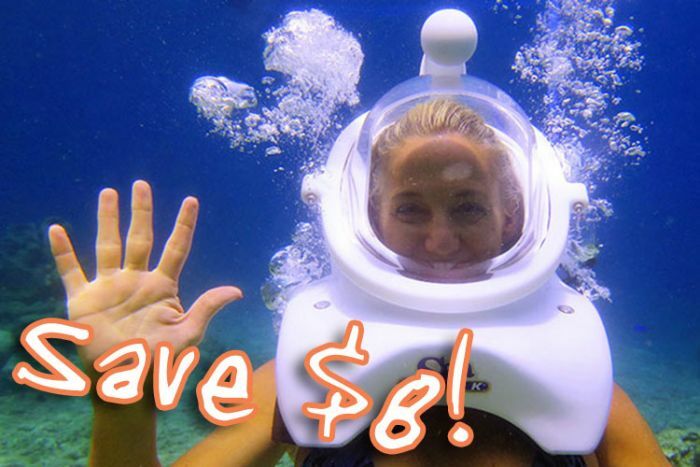 The price includes full entrance to Chankanaab Park so afterwards you can relax on the large white sand beach, watch the famous sea lion show and learn about Mayan culture too. 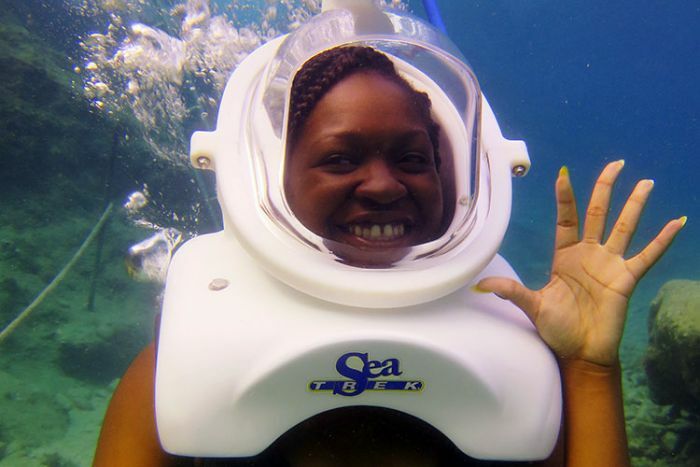 Since 1999, nearly 3 million people worldwide have been introduced to life beneath the sea using the Seatrek system. It's so simple practically anyone, including non-swimmers, children and the elderly, can be immersed in a world previously limited to those with advanced skills or certifications. 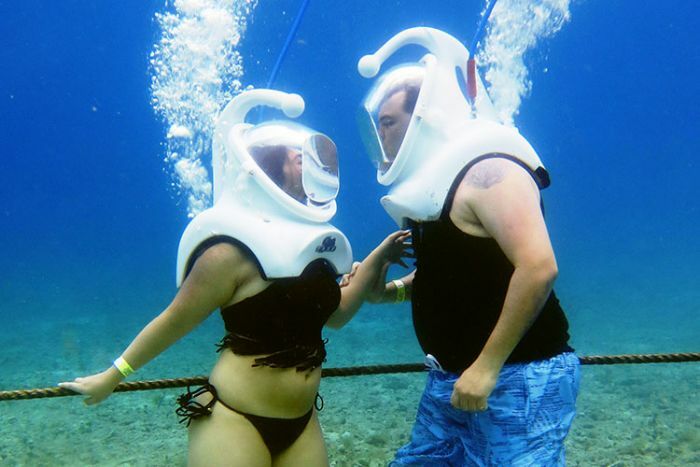 The San Francisco Chronicle described it, "as simple as walking and breathing, and you don’t have to know how to swim — you can even wear prescription glasses". 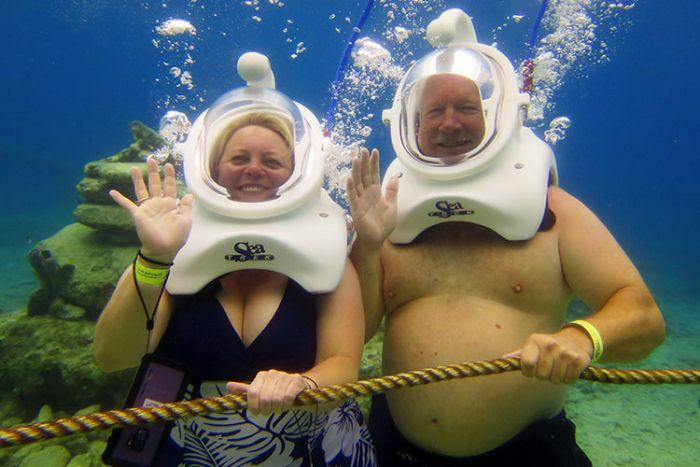 The entire underwater walking tour is conducted in less than an hour at a depth of 20-25 feet (6-8m). 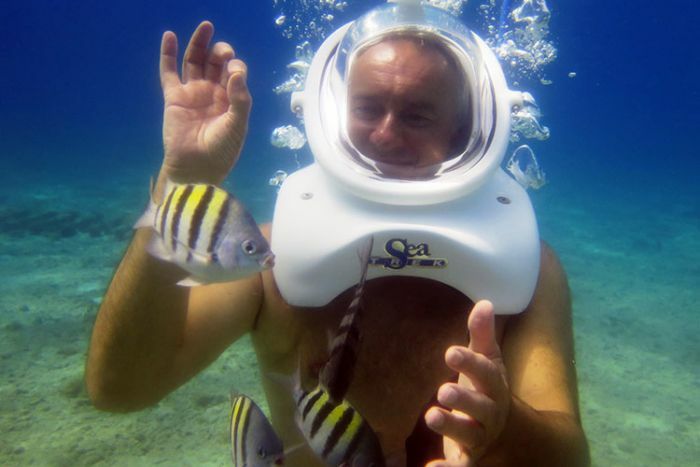 It was developed for those who would like to comfortably experience breathing and exploring underwater without the investment of precious vacation time. Guests breathe normally through their nose and/or mouth. There are no mouthpieces required. Air is continuously flowing through guests’ helmets at a rate that is 3x more air than what is typically needed to breathe normally. You can wear prescription glasses, sunglasses, and contact lenses during the Seatrek tour. You remain completely dry from the shoulders up. 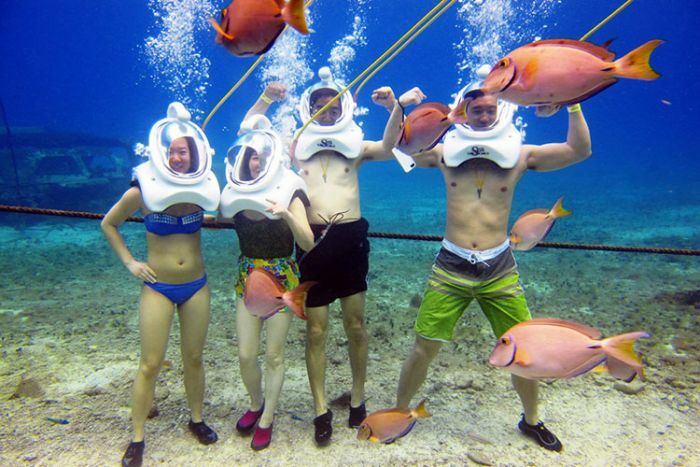 Chankanaab Park is a short taxi ride from the cruise terminals. Find detailed Meeting Point information here. 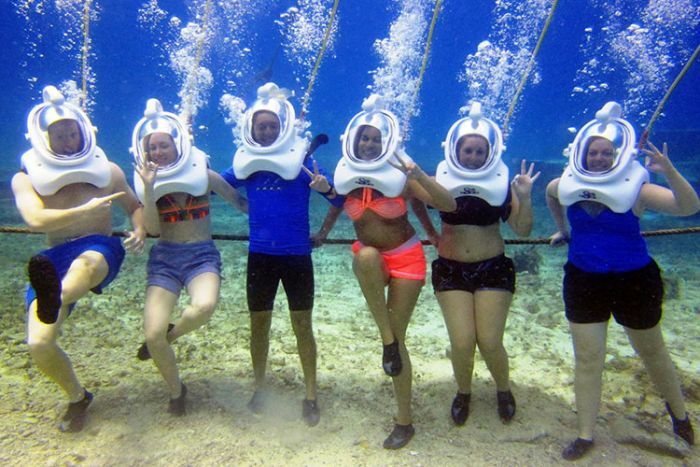 The underwater tour takes about 1 hour in total including 20 minutes briefing time and about 30 minutes underwater, then you can stay as long as you like at Chankanaab (open 8am to 4pm). 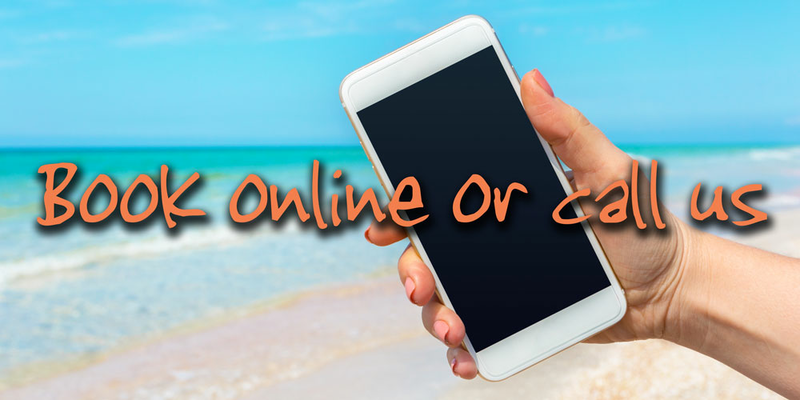 If you don't want to include Chankanaab, then this activity is also available at a convenient location with bar and restaurant on the oceanfront downtown. Perfect for relaxing, enjoying some great food or drink and exploring the downtown area afterwards. Find full details here. 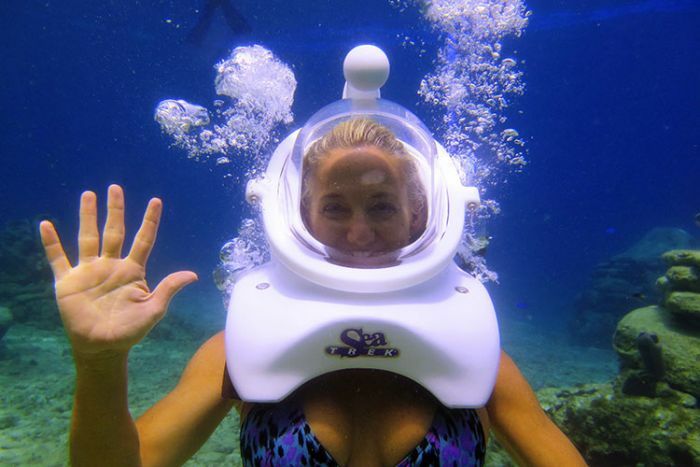 "My first adventure with "helmet diving" and I was at ease because of all the helpful staff. My husband and I had a wonderful time and we highly recommend this excursion"
Monday to Saturday, 9am, 10am, 11am, 12 noon, 1pm or 2pm. Takes place at Chankanaab Park on Cozumel's south-west coast, about a 10-15 minute taxi ride from downtown and the cruise ship piers, you can find it on Google Maps here. A taxi for up to 4 passengers costs approximately $10-$15. Minimum age 8 years, minimum weight 80lbs (36kg). Children under 18 years must be under the supervision of an adult at all times. Alcohol may only be consumed after the activity.